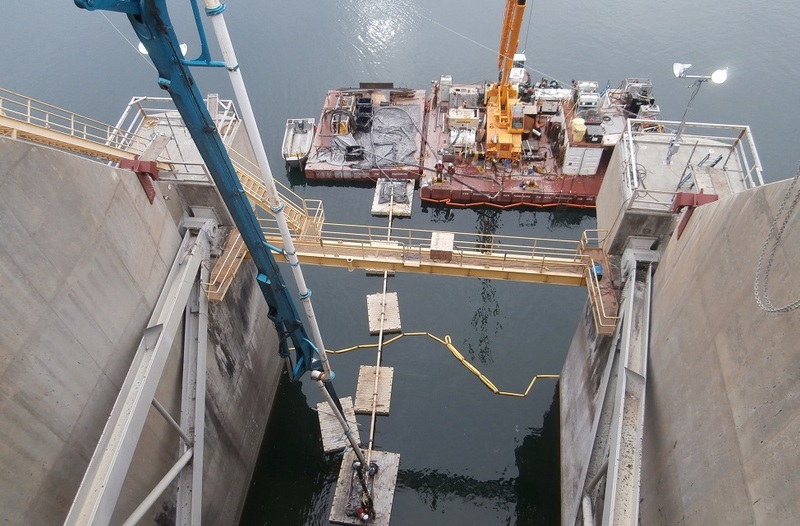 Spillway Repairs at Wanapum Dam - Global Diving & Salvage, Inc. 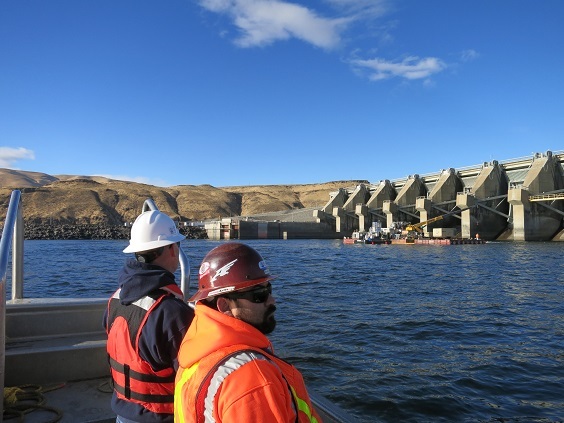 Global was contracted by Grant County Public Utility District to perform extensive spillway repairs at Wanapum Dam. The concrete on the apron, ogee and end sill on four of the spillway monoliths had become badly eroded over time. 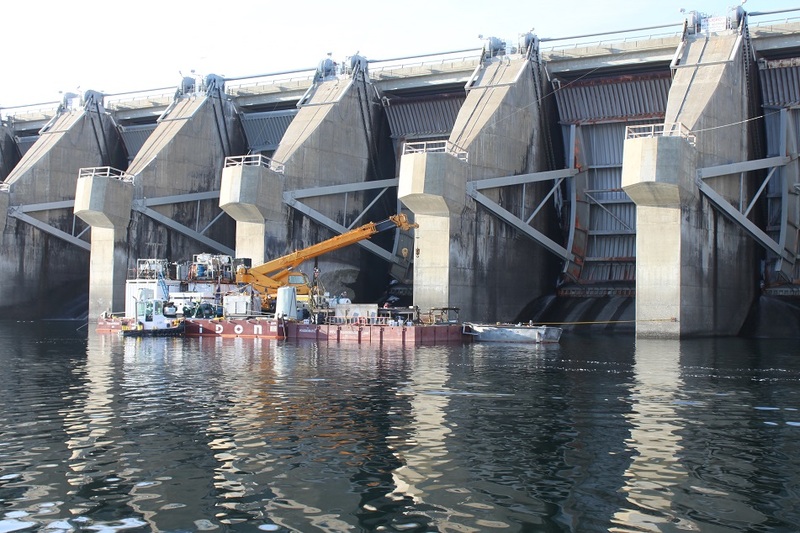 The Dive Supervisor, crane operator and 6 man dive team worked from a barge in the river in front of the spillway gates. Divers worked at a depth of between 35-50 feet using surface-supplied air and nitrox 60/40 mix. The repairs required demolition of the damaged sections using pneumatic chipping hammers and a hydraulic wall saw. Once the debris was cleared, the doweling, rebar mats, armor plates and forms were put into place. In order to reproduce the over-eroded contour and install the forms correctly, Global designed and fabricated a special template tool. Concrete was pumped into place underwater; after the concrete cured and passed inspection the forms were removed. 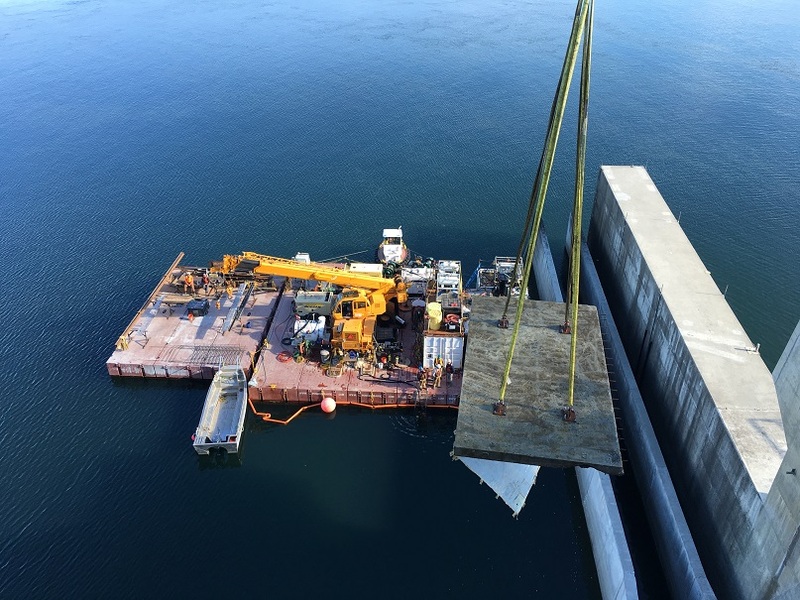 Over the course of the project, the crew completed the demolition and repairs of Pier Wall 13 on Monolith 12, as well as apron and end sill repairs on Monoliths 7, 8 and 9. Global placed 74 yd3 of concrete on Monolith Apron 7, 130.5 yd3 on Monolith Apron 8, 14 yd3 on Monolith Apron 9, 130 yd3 of concrete the combined end sill repairs to Monoliths 7, 8 and 9, and finally 8 yd3 on the Monolith 12/Pier Wall 13 repair; a total of 356.5 yd3 of underwater concrete was poured for the spillway repairs. Global adjusted their work plan to meet several challenges over the course of the project. Diver surveys revealed the erosion to the existing concrete was greater than the pre-bid survey indicated, resulting in larger pours than originally expected. Record-setting rainfall and snowmelt amounts resulted in extremely high river levels, so work at the site was temporarily halted on several occasions to allow for safe water release.